Research has shown a historical link between high temperatures and increased suicide rates. Projected temperature increases through 2050 could lead to an additional 21,000 suicides in the United States and Mexico, new research finds. By comparing historical temperature and suicide data, researchers found a strong correlation between warm weather and increased suicides. They estimate climate change could lead to suicide rate increases across the US and Mexico. “When talking about climate change, it’s often easy to think in abstractions. But the thousands of additional suicides that are likely to occur as a result of unmitigated climate change are not just a number, they represent tragic losses for families across the country,” says Marshall Burke, assistant professor of Earth system science in the School of Earth, Energy & Environmental Sciences at Stanford University. Researchers have recognized for centuries that suicides tend to peak during warmer months. 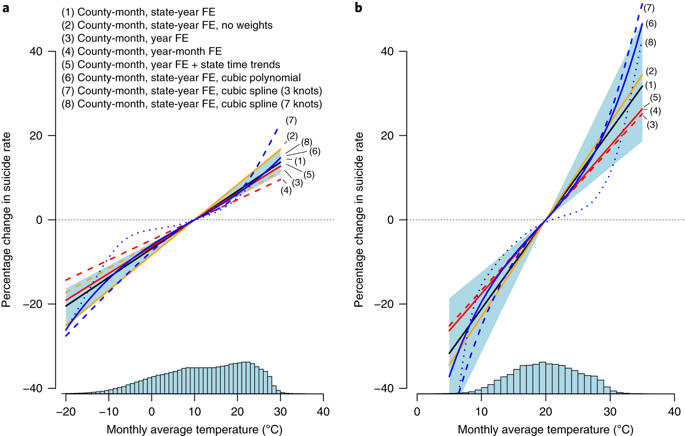 But, many factors beyond temperature also vary seasonally—such as unemployment rates or the amount of daylight—and up to this point it has been difficult to disentangle the role of temperature from other risk factors. “Suicide is one of the leading causes of death globally, and suicide rates in the US have risen dramatically over the last 15 years. So better understanding the causes of suicide is a public health priority,” Burke says. To tease out the role of temperature from other factors, the researchers compared historical temperature and suicide data across thousands of US counties and Mexican municipalities over several decades. The team also analyzed the language in over half a billion Twitter updates or tweets to further determine whether hotter temperatures affect mental well-being. They analyzed, for example, whether tweets contain language such as “lonely,” “trapped,” or “suicidal” more often during hot spells. As reported in Nature Climate Change, the researchers found strong evidence that hotter weather increases both suicide rates and the use of depressive language on social media. “Surprisingly, these effects differ very little based on how rich populations are or if they are used to warm weather,” Burke says. To understand how future climate change might affect suicide rates, the team used projections from global climate models. They calculate that temperature increases by 2050 could increase suicide rates by 1.4 percent in the US and 2.3 percent in Mexico. These effects are roughly as large in size as the influence of economic recessions (which increase the rate) or suicide prevention programs and gun restriction laws (which decrease the rate). “We’ve been studying the effects of warming on conflict and violence for years, finding that people fight more when it’s hot. Now we see that in addition to hurting others, some individuals hurt themselves. It appears that heat profoundly affects the human mind and how we decide to inflict harm,” says Solomon Hsiang, study coauthor and associate professor at the University of California, Berkeley. Additional coauthors are from Stanford, Pontificia Universidad Católica de Chile, Vancouver School of Economics, and UC Berkeley. Partial support for the work came from the Stanford Woods Institute for the Environment.